Thanks Andy, great site. And half of it is in English, imagine that! the former owner of that boat. Many pictures and good description of the keel mechanism, although the latter not important for the mini CP. Got more info today from Lucas. The CP is not available with anything but the fixed keel. His idea is to sell designs for a lightweight, inexpensive proto, for the experienced home builder, that is capable of finishing in the top ten. Simplicity is the key with this design. A 2D or 3d keel with dagger boards would add approx 60kg to the finished weight. It would adversely effect the boat's speed and performance, according to Lucas. He's more interested in getting the basic design on the water and having it seen and sailed, so others buy it and build it. Got all the rig dimensions and sail specs from him this morning too. This build will be happening soon. Just waiting for a few more answers to a few more questions. Unfortunately the time zone difference between here and France makes it quite the waiting game for correspondence. I'm from Quebec city and i would like to know if somebody have start building a Didi-mini MK2 already. I am building a Didi Mini Mk1. I believe the only difference is the cockpit layout. I do like the longer side decks on the Mk2. Don't know about the Didi MK2. I ordered the plans and CNC files for the Mini CP though. Waiting patiently for that package to arrive. But now I don't have any until my boat gonna be ready. I hope to have a mini circuit soon in N.A. 5x10 ft sheets and what is the approximate cost for cnc cutting. I am CNC cutting the Dix Kits for NA. If you need someone to cut the Lucas kit in NA, I will need a copy of the CAD files to estimate costs for ply, CNC progamming and CNC time. I was hoping jake had ordered plans but seems hes now looking for completed mini. some help to me if I could get a handle on what the approximate cost of cnc workwould be. nested . I could email the designer . Are there any others in usa serious about this design. I reviewed the details of the MiniCP design and found it not to my liking for a proto. I wanted some changes, including cold molding the hull, and canting keel. Lucas is not willing to sell the CP for anything but "as designed" builds, no modifications aloud. I asked him about other plans, but for a custom design, the price after Euro to USD conversion is daunting. I am now talking with a local naval architect as well as several active mini racers to come up with a one-off design. The idea is to cold mold the first hull, pull a female mold off the hull, then complete the cold molded boat as a full size model. If all works well, then production can begin on a per order basis for a laminate boat. I work in the boat building industry in S. FL, so this is more than just a pipe dream or a garage build project (not that there is anything against garage built projects). I have the facilities and the backing to do it right. 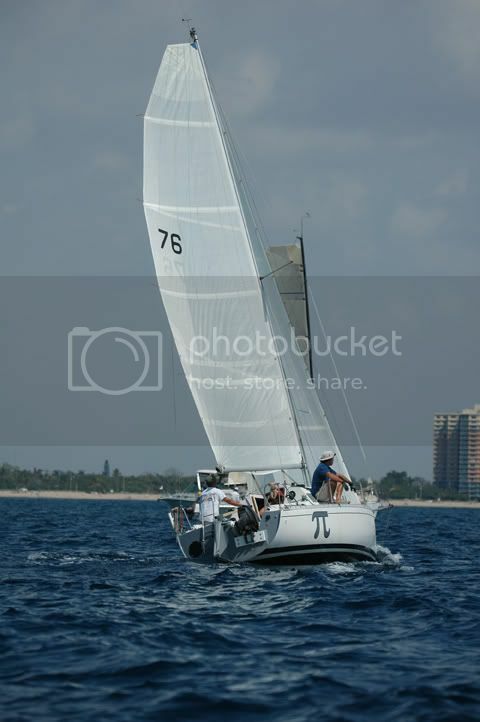 My wife sailed the Lauderdale to Key West race on Pheonix 670 with Andy Abel. We had a deal that if she completed the race, walked up to me on the dock and said "WOOHOO! What a ride! ", I had to stop talking and start building. I was cleaning up the carnage on the Sydney 36 I sailed on for the race when she showed up at the docks at the Galleon with a big smile on her face. So I guess I better start building.